I was sitting in my office at home trying to get past the total lack of inspiration for this week’s devotional and I happened to look up at a picture that sits on top of the hutch on my desk. 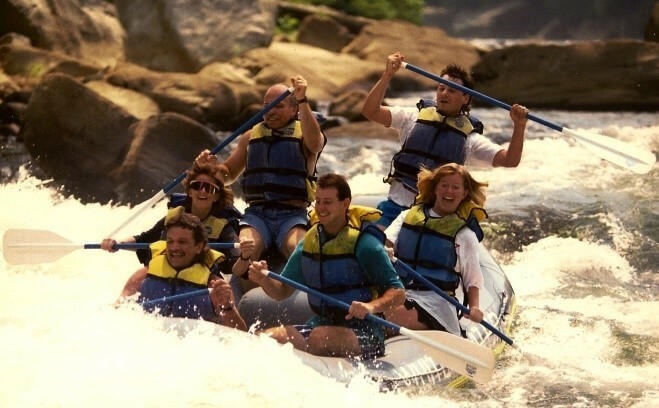 It’s a picture that’s nearly 25 years old and it captures me and some friends navigating the first rapid we encountered on a white water rafting trip on the Lower Youghiogheny River in southern Pennsylvania. This was what’s known as a “guide escorted” tour, which means you don’t have a guide in your raft. Instead, a single guide goes with a group of rafts and provides instructions on navigating the rapids you encounter along the way. Looking at the rafting company’s website today, it talks about the scenic river that this rafting experience takes place on. To be real honest, I don’t remember much about the scenery in the 5 hours we spent on the river. Instead, I remember the rapids. Don’t get me wrong, I loved it – it’s just that the scenery was secondary at best. I guess my mind was so caught up in thinking about the last rapid that we had just made it through, anticipating what the next rapid would be like or trying to stay in the raft as we navigated each rapid that I just didn’t have the mental bandwidth to take in the natural beauty around us. As I looked at this picture and recalled the experience, it struck me that life can often be like whitewater rafting. I don’t know about you, but I seem to find myself floating from one area of turbulence to another and there are times when all I can think about is the difficulty I have just come through or the fear of what might lie ahead. Perhaps it’s no coincidence that, in the midst of pondering this, Facebook popped up a memory from eight years ago where I shared this excerpt from a prayer I had come across: “Days pass, years vanish, and we walk sightless among miracles.” With a little research I discovered this if from an ancient Hebrew prayer and it’s a good reminder for me today to keep my eyes open to the miracles that are present – even in the midst of the turbulence of my life. Here’s the entire prayer. I hope you’ll find some comfort in it today or in the days to come. Days pass and years vanish, we walk sightless among miracles. God, fill our eyes with seeing and our minds with knowing. Let there be moments when your presence, like lightning, illumines the darkness in which we walk. Help us to see wherever we gaze that the bush burns unconsumed. Mark is an ordained minister in the Christian Church (Disciples of Christ) and is currently serving as the Associate Pastor of Caring Ministries here at Saint Andrew Christian Church. Mark can be reached at mark@sacchome.org.